Shark Death Thanks for your reply. I was so bummed when I got home from work the next morning he was dead. Never seen that one coming that quick, he probably had a major disease of some kind I still can't find. <Soooo sorry to hear that. Please accept my condolences, I know how hard it is to lose them. MacL> Charlie will have to do for now, and he gets usual cleanings from a shrimp that rests over him all the time. Thanks anyway. Unhappy and not feeding banded bamboo shark - emergency!! <MikeD here> Thanks for the reply, Unfortunately the shark was too poorly by the time I got back from the shop. He was swimming in circles and upside down, and I picked him up very gently with my hands and he offered no resistance at all. I held him up at the top of the water (Still under water) and tried to feed him with a syringe of bits of blended frozen food (krill, brine shrimp and shark formula food), however I couldn't get any down him and didn't want to force him. He died shortly after :-( <Truly sorry. It's a feeling I know all too well.> I have eliminated the voltage in the tank with the titanium ground probe, and have increased to 10% water changes weekly. I do hope to get another some time, but I have learnt the hard way (even after much research), I will in the future never put any meds of any sort in the tank.<That may have made the lesson and sacrifice worthwhile all by itself.> I do think that the voltage didn't help, but it was the Kent Marine RxP that stopped him eating. Do you have any tips for feeding them, as I've talked to other banded bamboo shark owners who just drop food in the tank and they eat it, but the tank has a fair bit of clean-up-crew, so it wouldn't last in mine.<I suspect that your shark was pretty far gone when you got it, and possibly nothing that you could have dome would have made a difference. A healthy shark would DEFINITELY get his/her share, with no clean up crew able to stand in the way. As with many creatures, IMO a varied diet is the key, and while I've never used the product and may be speaking unfairly, I'd use caution with "special" foods such as the shark diet that you mentioned. All too often the appeal is directed at the human purchaser and what you end up with is actually an inferior product designed to do one thing and one thing only...garner profits for the manufacturer. 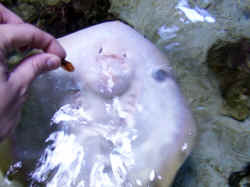 "Shark diet", "Betta diet", etc., etc.....research the animal in question's natural diet and come as close as you can and the results will likely be MUCH better.> I was feeding him with tongs, but he wouldn't touch anything but octopus. I'll wait until we have the big tank setup, and not have any (or less) cleaner shrimp!<don't feel guilty about that, as it was entirely your fault...had you gotten a healthy animal the shrimp would have ended up cleaning from the inside.> Thanks for the help. Tom. Shark Sick - 2/28/04 hi, my shark has this small white spot above his left pectoral fin. It just appeared like 3 days ago. I was wondering if you could tell me what it was. <Need more info. What kind of shark are we talking about? What kind of tank? Feeding? Vitamins? Current size of the shark? Filtration? Water Chemistry? Pictures of the infected area?> also, he has a light pink kind of rash looking spots on his stomach and I was wondering how to get rid of those too. <Need more info, please. 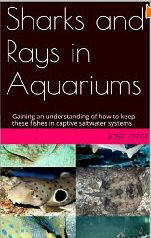 Once you provide me that info we (= me and some of the staff at the Monterey Bay Aquarium) will see what we can offer in the way of identity and remedy. Thanks ~Paul> any help is appreciated. 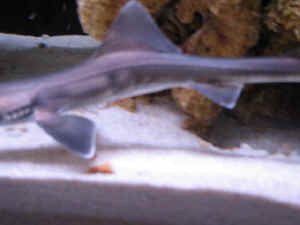 Leopard Shark Info I have three Leopard Sharks pups in a 375-gallon in wall aquarium (L96 x 30W x 30H) with two 10? Naso Tangs, One 9 Atlantic Blue Tang, and some live rock. I've been feeding them frozen Krill and Silversides. One is 10?#8364;?, one is 12?#8364;?, and one is 15?#8364;? in length. I'm getting a 900-gallon (96L x 36W x 60H) reef ready aquarium system with chiller custom built for them soon. <Wowzah, can you adopt me?> But just recently they have developed dark spots on their bottom side just behind the throat and under the gills. The spots look like bruises that someone's risk or arm would get if it were griped to tight. The tank has been set up for seven months now and I am running two wet/dry filtration systems one is a Bio-Ball system the Aqua Clear Pro 300 with protein skimmer and I'm using a 1200 GPH return pump, and the other is the Marine l and Bio wheel Tide Pool-II with a 900 GPH return pump. I think the tank has good circulation and the water quality looks good the AmmoniaNH3/NH+4) is 0ppm(mg/L), the high range pH is 8.2, the Nitrate (NO-3) is 0ppm(mg/L), and the Nitrite (No-a2) is 0ppm (mg/L). <Wow... commendable... no nitrate?> But the temp is about 76 degrees F. About two month ago the sharks were scratching on the sand surface, yawning frequently, and in mid swim would turn and bite their tails like a bog with fleas would bite its rear end that was a site to see. I treated them with some Life Bearer that was recommended by someone that has Sand Tiger sharks the symptoms cleared up. I thank they got the infection from some panther groupers that may have been infected I moved the groupers to a 125-gallon aquarium with a two flames, two coral beauties, and a Lemonpeel. <Watch these Chromileptis... they will eventually inhale your Dwarf Angels> But I notice the spots on the 15?#8364;? Leopard shark pup before the scratching started and though nothing of it, but now the 10?#8364;? and 12?#8364;? leopard shark pup is starting to get the same spots. Is this a sign of improper food or vitamin deficiency or not enough dissolved oxygen in the water, or could this be from the temperature being to hot? <Most likely a mix of all... penalization around the throat area isn't necessarily a danger sign... If you have occasion to have one of these specimens out, I would run a "skin scraping" (a microscope slide) across this area (from head to tail direction) and take a look under magnification. 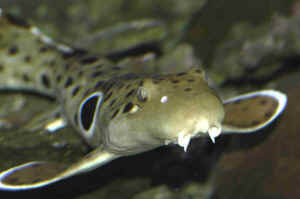 Don't think that you have body flukes going here, but...> Is this something that is normal the leopard sharks? <Not uncommon as I state> I am in the process of making a home made chiller out of a 1-1/2 cubic feet dorm size refrigerator and 100ft 3/8 tubing hose to get the temp down to 68 degrees F. <For this size system, it will take more than this refrigeration to make a difference. Take a look at the manufacturers on our sites Links pages (www.WetWebMedia.com), in particular Aquanetics Net Pages on calculating horsepower necessary for a given volume and draw down temperature... don't waste your time, money on the dorm fridge> I don't know how well this will work I got the plans of line if it don't't work I'm'm just out $175.00, But my main concerned are the spots on the sharks should I be alarmed about the spots? <IMO/E no, not alarmed> Also if it is possible could someone recommend a good book or web site to get good information on the care of Leopard Sharks or just Aquarium Sharks? <The new one by Scott Michael is about out... I do have a review/edit copy... very worthwhile> I'm'd like to know Minimal circulation or current requirements per gallon, the best type of filtration, Medications, and correct temp I've herd that it was about 65 degrees. <Vigorous, over-sized and yes, right about on the temperature... or even lower. Bob Fenner> Sincerely, Michael Hunter. PS'? 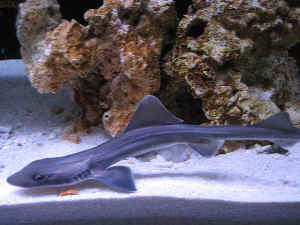 I am inclosing some photos of one of the leopard sharks so that maybe you can help me find out what is the problem. Mystery Death Bob, Thanks for your advice on my epaulette shark, which is going great by the way, but I lost a harlequin tusk yesterday which went in at the same time as the shark. Also my black Volitans lion is acting strange, not eating for the past 5 days. He doesn't look sick and he and the shark don't fight but the shark does tend to get in all the lions favorite caves and push him into the open. Tank specs seem fine-155gallon,0 ammonia,0 nitrite,20 nitrates,ph8.2.Only thing I can think of is the shark has overloaded the tank, other fish are-2 Chromis, tomato clown, blue tang, sailfin tang, coral beauty, Foxface, Picasso trigger, Heniochus, blue damsel. All ideas welcome, Cheers, Scott. >> Agree with your assessment of "shark relatedness" of the losses... paralleled by nitrate accumulation and detailed behaviors... More water changes, more specialized surface feedings, more use of chemical filtrants... bigger skimmer... Bigger system!